Solorio Academy High School is named in honor of Eric Solorio (1979-2006), a former member of the Chicago Police Department’s elite antigang unit. 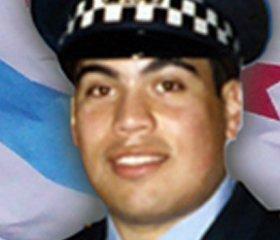 Solorio died in 2006 at age 26 nearly a month after his squad car went out of control during a chase. Friends and family say there was a constant urgency about him, who since childhood searched for ways to help others. Today, we honor Officer Solorio’s life by working hard to educate ourselves and make our community a better place by dedicating ourselves to serving others. Solorio Academy High School opened in 2010 to address enrollment challenges caused by the rapid growth in student population on the Southwest Side. The building is “Silver” level certified under the U.S. Green Building Council’s Leadership in Energy and Environmental Design schools’ rating system, and includes a green roof covering 40 percent of the building. The Solorio building was the first to implement CPS’s Urban Model High School (UMHS) design and was part of the Modern Schools Across Chicago (MSAC) program. The building contains more than 200,000 square feet and includes science, computer, visual and performing arts classrooms, as well as a library, a gymnasium, a swimming pool and playing fields and tennis courts. The school opened with grade 9 and has added a grade each school year. In June of 2014, Solorio celebrated its first graduating class. The school has 40 classrooms and serves 1,185 students. Chicago Public Schools (CPS) turned over management of Solorio Academy High School to AUSL in 2010 as a training academy. Training Academies are neighborhood schools in which residents are trained. These schools are not turnarounds but were opened with the purpose of developing highly effective teachers for the challenging urban environment.